My first word when I entered Diagon Alley was “WOW”. This was definitely the highlight of the tour. I apologise for uploading so many from this part of the tour. The lighting kept changing and I lost count the number of times I just walked up and down (with my mouth probably wide open)! These photos don’t really do it justice. It has to be seen to be believed. I can’t wait to go back. 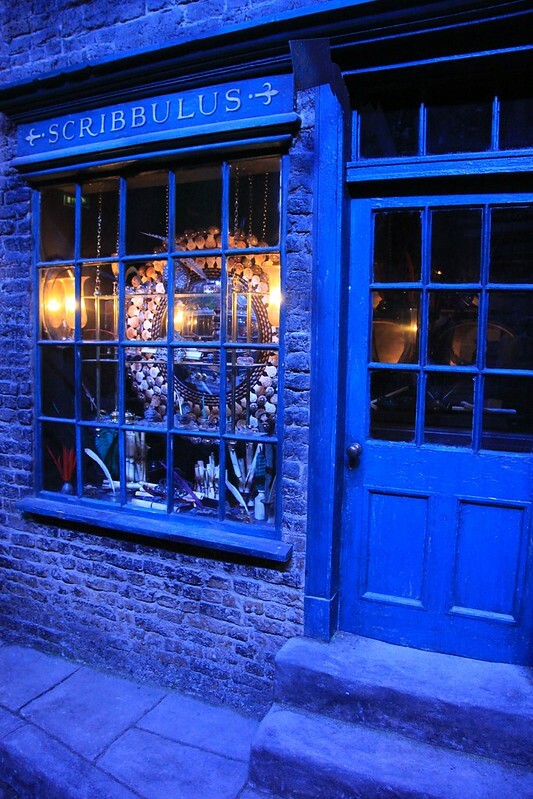 The Diagon Alley set has never been the same twice. Since its construction for Harry Potter and the Philosopher’s Stone walls have shifted, shopfronts have moved and entire buildings have come and gone. In fact, many of these set pieces were redressed and repurposed as Hogsmeade village for Harry Potter and the Prisoner of Azkaban. Years later Stuart Craig and his artists went back to the original drawings and redesigned all of Diagon Alley for Harry Potter and the Half-Blood Prince. Each building’s architecture was carefully tweaked and refined to create the picture-perfect street as it is now. Image published by Karen Roe on 2012-07-08 17:29:08 and used under Creative Commons license.